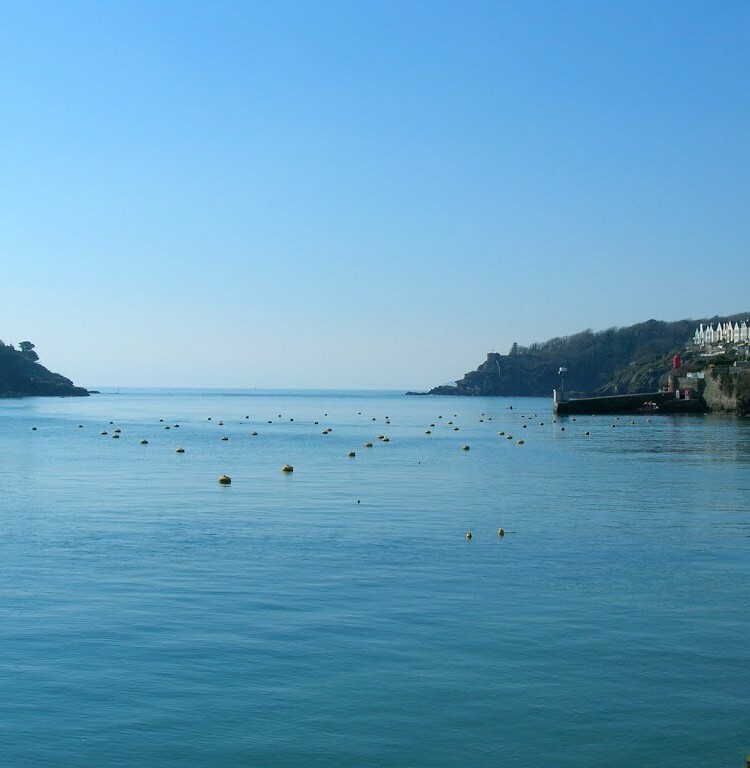 Fowey is one of our favourite local destinations, but we don’t manage to get there very often. However, we succeeded a couple of weeks ago – how time flies – and had a very enjoyable time of it! In fact it was the 5th March, St Piran’s Day, the patron saint of Cornwall so what better cause for celebration. Occasionally we drive to Polruan or Bodinnick and take one of the ferries, but this time we drove to Fowey itself. Parking up at the top of the hill, we wandered down through the winding lanes and alleyways, past the obligatory ancestral pile and through the churchyard to the river and main part of town. Having watched a big china clay tanker go up the river (Fowey is a deep water port), we wandered upriver ourselves, passing a number of little shops and galleries until we got to the Bodinnick Ferry where the cars can cross the water. We surmised that this was where the station must have been when the railway used to come to Fowey and then seeing a road named “Station Road” we decided to follow it. We ended up on the Saints Way, a long distance footpath and went through a delightful woodland ending up at the top of the hill overlooking the Fowey river and town. We were both much impressed with the wide expanse of water featured below. The treat of the day was, as usual to have lunch at Pinky Murphy’s Cafe as we find the food there to be exceptionally good. We are obviously not alone in this, it is quite a popular haunt and it has been known for us to be turned away due to lack of space. We were lucky this time and sat down contentedly upstairs in our favourite location, both diving to the bookshelves so we could peruse our chosen literature while we waited for our lunch. Pinky Murphy’s is a quirky but fun establishment and has an eclectic mix of, well, everything – cutlery, crockery and furnishings all delightfully mismatched with, surprise surprise, many shades of pink to be found scattered about. Although the desserts looked tempting, we decided we really ought to get out in the spring sunshine before it disappeared. For our afternoon perambulation we went up to the castle on the south side of the town, passing Ready Money Cove on our way. After sitting on some rocks by the castle, soaking up the sun, we exerted ourselves further by walking along the cliff path for a while. The sea was a dazzling blue and naturally we had to stop and appreciate it further. A thoughtfully placed bench provided us with the necessary back support. Never has working up an appetite for tea been so pleasant! As the sun started to sink into the ocean we knew it was time for tea. Decision time – cake was a must – did we go back to Pinky Murphy’s for the rather delectable chocolate refrigerator cake we had seen earlier or should we try somewhere different? We opted for adventure and ended up at The Dwelling House, a tea shop which specialised in teas for the connoisseur – not that we fit that category, but thought we’d give it a go. The chocolate cake was delicious, aided no doubt, by the huge dollop of clotted cream. The tea was also excellent. My Silver Needles (white tea) was served in a wonderfully designed teapot which would not look out of place in a Japanese tea ceremony – hardly surprising as it was from Japan. The tea ambiance was reinforced by the singular sight of teacups hanging in picture frames all around the room. Fully replenished, we staggered slowly up the hill secure in the knowledge that we had yet again shown no restraint. But it was fun! Fowey is just lovely. Your pictures capture the place beautifully. I adore Cornwall, you are very lucky to live there, and normally I would be very jealous: but I have just booked to fly down (yes fly!) in June – hooray!. Wonderful photos, and it looked like a really lovely day – could you send some of that spring like weather up to Edinburgh please? Oh Lucie, I am indeed lucky to live here. I hope the weather is good to you when you come. Sounds like you know Fowey well. Chele – sounds like you’re having a rather chilly time of it still. That lovely spring weather has disappeared here – it’s been raining for the last week! Now I have the passionfruit, I seem to have run out of inspiration! I went to Fowey and to Pink Murphy’s a couple of years ago. Do they still have the lazy susan with the cakes on? We loved Fowey and your photo’s brought back very fond memories for us. very nice place, lovely pics..
What a lovely place, to my shame I have never been to Cornwall, I have managed Devon a couple of times, but our holidays are always spent in Wales. Well it’s just next door to Shropshire. At least it sounds as if you walked off the good food, and I love that teapot too and the cups hanging in the frames – what an inspired idea! Gorgeous photos – you are very lucky to live there! Great antidote to a grey, miserable day! Good for you – restraint is soooo over-rated. We have fond memories of visits to Fower, but haven’t managed to visit recently, I will definately get to Pinky Murphy’s next time! Margaret – not sure about the lazy susan, but it hasn’t changed much in the last 4 years or so since we’ve been going there. Thank you for your lovely comment Celia – it’s nice to share some of our best loved places. Kath, well no wonder you go to Wales – it’s close and it’s wonderful. If I couldn’t live in Cornwall, I’d try and live in Wales. They had those teapots for sale and I wanted one, but they were a little pricey and I couldn’t quite justify it. Thank you Sharon – I could certainly do with some of that sun now. Vegboxboy – us show restraint? Perish the thought! Cottage Garden Farmer – do try it if you can. Oh wow, I love Cornwall. Your pictures are very ‘Daphne Du Maurier’! I am also really taken with the picture frame with cups, that is such a cool idea. I have a couple of decorative cups and I think that might just work for them! Lovely photographs! And it made me smile… we had a lovely holiday in Fowey whenI was 14! Janice – look forward to seeing your take on framed cups. Thank you Wendy – when are you coming back? I loved my visit to Fowey. It’s very high on our list of places to go back to as soon as possible! I’ve never been there. Cornwall has some beautiful places.